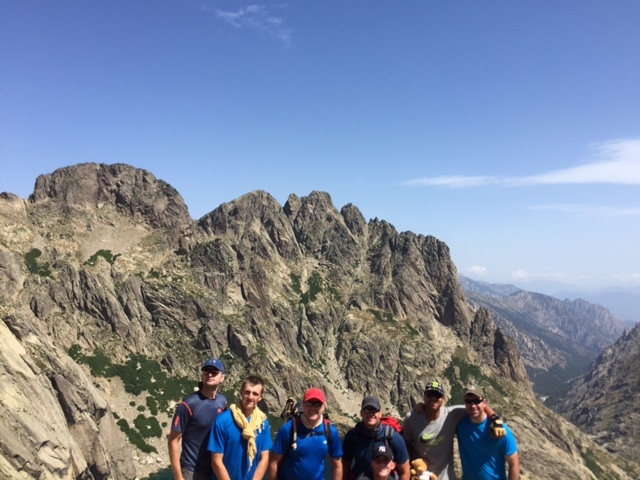 If you look up the GR20 online you will see it described as “the toughest long distance trail in Europe”. 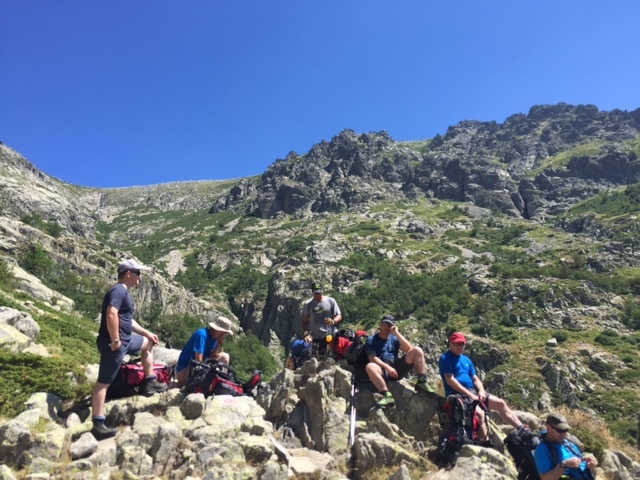 Spanning 300 miles and crossing Corsica from Calenzana in the north to Conca in the south the GR20 crosses some of the most spectacular mountain terrain in Europe and is coupled with an incredible Mediterranean climate. Normally people trek from north to south however we were to be trekking from the halfway point in Vizzavona northwards towards Calenzana. After two days of kit issue and travel we arrived in the afternoon and were immediately able to sample some of the fine local food and drink and speaking to some of the groups who had come southwards we soaked up some important information and went to bed full of nervous anticipation for what was to come. 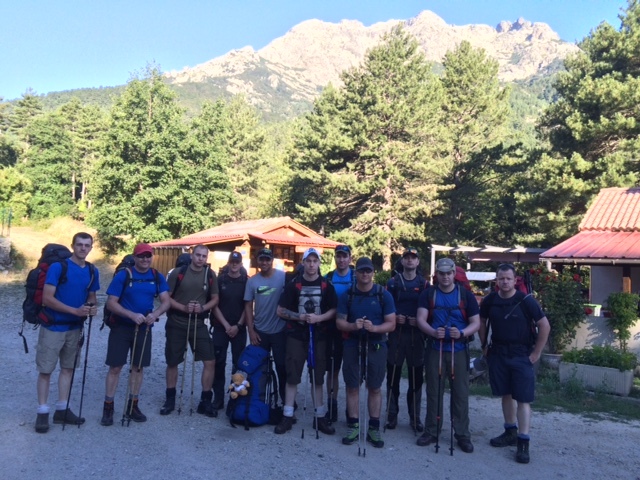 After buying ourselves some food and having a quick breakfast of biscuits we set off the next day in to the hills on our way to the Refuge de L’Onda. Immediately we were struck by the climate, as the day warmed and the sun rose higher and higher behind us water became scarce and with few sources along the route the sight of the refuge with its fresh water spring and fenced campground was certainly welcome at the end of the day! At the Refuge de L’Onda we discovered the delights and pitfalls of life in the mountains. A small omelette made by the Gardien who ran the refuge cost 8 euros, with a small loaf of long life bread costing 4 so the 11 euros we had each day wasn’t going to stretch very far! After our first night on the mountains, disturbed only by the large group of French improvising a didgeridoo, we set out towards our next stop: the Refuge de Pietra Piana. Climbing up through the forest in the morning we soon broke out on the sides of the mountains and again the climate began to take its toll. 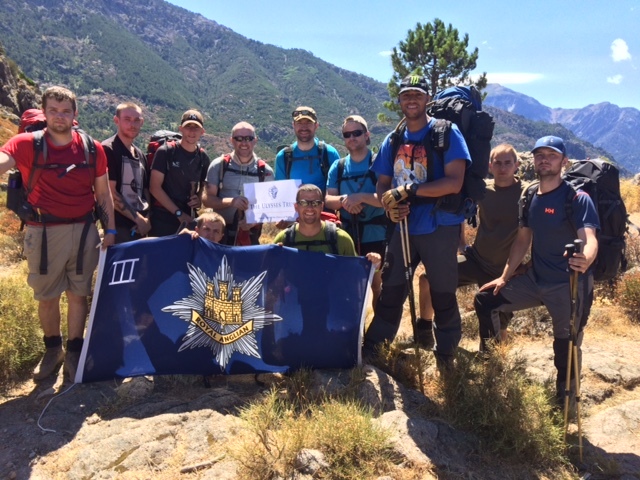 With two of our number injured early on in the day progress was painfully slow and as we started the final climb of the day morale, as well as water, was low. 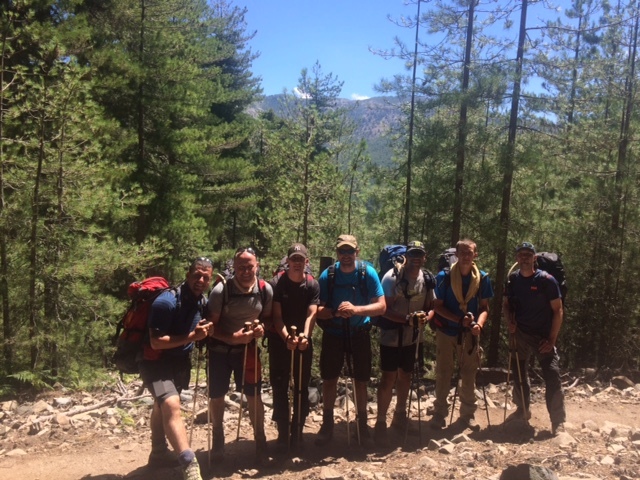 However as we finished the climb and the refuge appeared through the low bushes on the side of the hill spirits were raised and we soon settled in to our already normal routine of tents, dhobi, ablutions and food. Our third day began with goodbyes to the injured members of our party who would have a long slog back the way we came to an escape point where they could be taken to medical care. With seven of us left we set off in to what would be a fine day in the mountains. 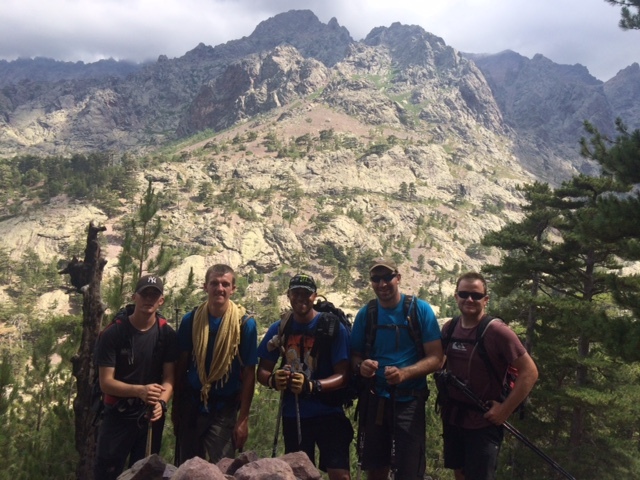 Climbing from the refuge we immediately took to the mountains and stunning views across Corsica awaited us. Today was the first day we would encounter the chains that have been placed on certain parts of the trail for the protection of climbers on the route. Although a short climb of ten metres or so this section was our first taste of true climbing on the trip and left us feeling good for the rest of the day as we carried on through the mountains to the refuge at Monganu. Here we found a wonderful refuge with a stream running alongside which, as we had for the last two days, we took advantage of for a spot of swimming. Climbing a little way downstream we came across a pool nine or ten feet deep, perfect for jumping in to and finishing up our day before an evening spent out on the warm rocks looking up at the stars and watching shooting stars streak across the sky. Our last day of this first part of our trek we set out from Monganu towards the Castel di Verghio, striking out across the mountains at first before descending through a forest path, all the while passing people fresh on to the trail who must have looked at us with some trepidation as we came down from our fourth day! After one final heartbreaking hill we reached the ski resort at Castel di Verghio where we met our admin driver who waited with a well deserved beer and some sandwiches to help us refuel after a long few days in the hills. From here the group moved by car to Haut Asco as the next stage was out of bounds due to a land slide, and a bit of rest before the climb the highest point on the island, Monte Cinto, the next day. After a very successful day conquering Monte Cinto we set out again on a harrowing two hour climb immediately up the mountain behind Haut Asco but upon reaching the top the views back down the way that way had come and onwards towards the ridges and mountains of Corsica made that climb more than worth it. A fine ridge walk criss-crossing the mountains followed and we came down to the Refuge de Carrozzu via another protected section along smooth stone slabs that dropped off into a ravine. A rope bridge over a long drop brought us in to Carrozzu with its balcony overlooking the valley and a fine shaded campsite reminiscent of the Ewok village in Return of the Jedi. Another harsh climb followed the next morning giving us a view of Carrozzu from high above before a smooth descent into what would be our final mountain camp at the Refuge d’Ortu di u Piobbu, which was built onto the slope of the mountain with the city of Calvi just within view in the distance. Here was an ideal opportunity for our last games of cards within the mountains as we reflected on the tally of the days we had put in – 59 miles of the hardest long distance trail in Europe; 5,200 metres of ascent; 5,960 metres of descent; innumerable plates of pasta and tens of omelettes, both powdered egg and fresh. After a final descent into Calenzana we met with the admin team and found a nearby bakery for celebratory cold drinks and pizzas and moved into a final admin phase that let us deal with sore feet and smelly kit and reunited us with the home comforts that we’d stashed in the admin vehicle, as well as allowing us time to charge phones and speak to family back home.